The New Jersey Department of Education released Guidance for Reporting Student Absences and Calculating Chronic Absenteeism in May, 2017. The Department of Education identified chronic absenteeism as its indicator of school quality and success for accountability under the Every Student Succeeds Act. This guidance clarifies policies and expectations for reporting student attendance data in the statewide reporting site, NJ SMART, and the methodology for measuring chronic absenteeism. New Jersey added chronic absence as an accountability metric for elementary and middle schools as part of its waiver from No Child Left Behind’s (NCLB) strictures in 2012. School performance reports produced by the NJSMART data system now reflect how many students are missing 10 percent or more of the school year for any reason—excused or unexused. Schools are compared on this and other measures to a cohort of peers with similar student populations. Any school with more than 6 percent of its enrollment determined to be chronically absent are advised to begin to pay closer attention to attendance trends. Previously, New Jersey tracked only average daily attendance and truancy. 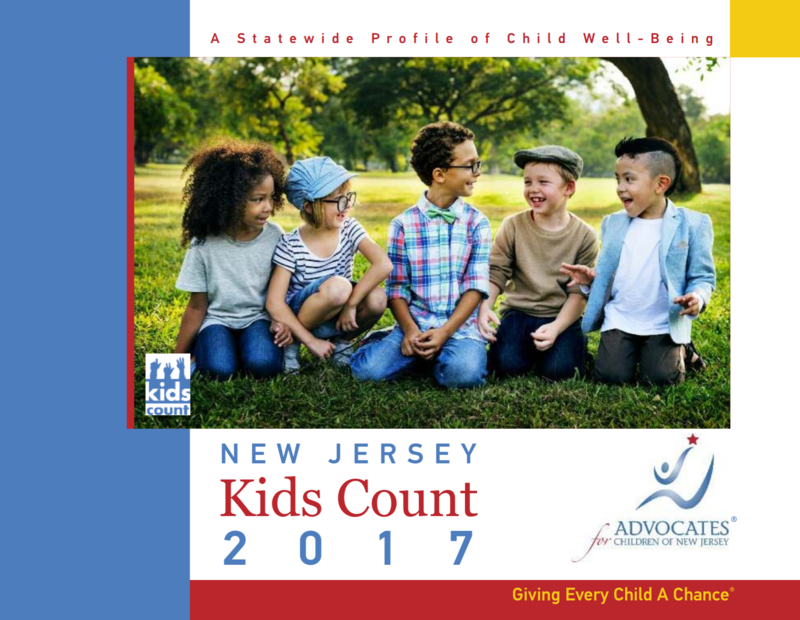 In November 2017, Advocates for Children of New Jersey (ACNJ) analyzed the state’s attendance trends in New Jersey Kids Count, 2017. For the 2014-15 school year, the review found that 12 percent of children missed too much school. Economically disadvantaged students and students in special education were more likely to be chronically absent. Find the full report and interactive data charts here. 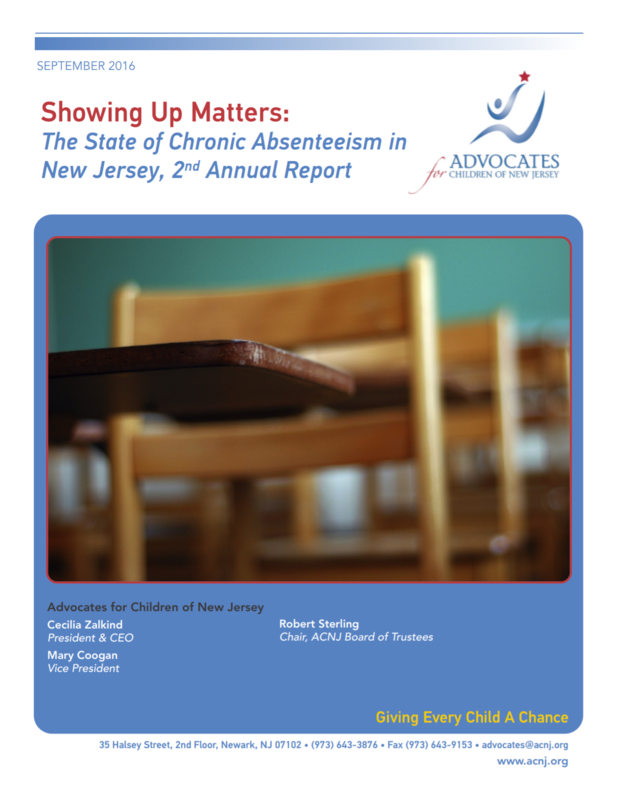 In 2017 Advocates for Children of New Jersey (ACNJ) also released Showing Up Matters: The State of Chronic Absenteeism in New Jersey, 2nd Annual Report. This second analysis of data collected by the New Jersey Department of Education finds that roughly 136,000, or more than one in 10 New Jersey students from kindergarten through 12th grade were chronically absent during the 2014-15 school year. Find the report here. 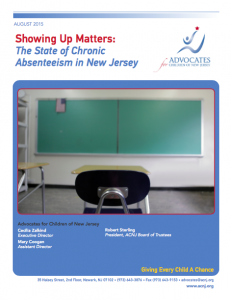 In September 2015, Advocates for Children of New Jersey (ACNJ) used the data collected by the state Department of Education to map the state’s attendance gaps in Showing Up Matters: The State of Chronic Absenteeism in New Jersey. Find the report here. Chronic absenteeism starts early with 12 percent of the state’s kindergartners missing too much school. That compares to 11 percent of 9th graders and 12 percent of 10th graders. Children from low-income families are more likely to be chronically absent. Nearly 15 percent of these students missed too much school, while the statewide average was 10 percent. Nearly 28 percent of homeless children were chronically absent. Children of color are more likely than peers to miss 10 percent or more of the school year. About 15 percent of black students and 12 percent of Hispanic students were chronically absent, compared to 8.3 percent of their white counterparts. Still. white kids constituted the largest number of chronically absent students. Students with disabilities had rates of chronic absence: 15 percent compared to the statewide average of 10 percent.